The Institute of Inspection, Cleaning and Restoration Certification (IICRC) conducted a study in November of 2014 to determine the top stains of the holiday season. They found that Chocolate, Punch, Grease, and Wine are the most common Carpet Stains in Birmingham, AL over the holiday season. Holidays are a great time to spend with family and friends, partying, eating and drinking. Unfortunately many of these items end up on the floor, in carpets, and on upholstery. One of the worst problems with these types of stains is that they often happen and we are not even aware of them until the next day or when you are cleaning up. Even if you were present when the spill occurred, you probably didn’t have time to properly clean it up if you were in the middle of entertaining or visiting with friends and family. The last thing you want to do in the middle of a party is to get down on your hands and knees and clean up spill, spots, or messes. So, the next day or two, you come across stains that have now dried and are set-in to your carpets, rugs, couches, or chairs. 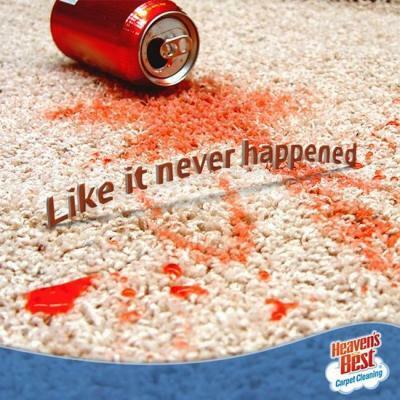 If this has happened and you don’t know what to do, the best thing is to call a professional like Heaven’s Best Carpet, Rug & Upholstery Cleaning. Often if you spray a cleaner or chemical spray on some of these stains, it can mix with the stain and cause it to set in even worse. So, if you’re not sure what to put on it, call Heaven’s Best. We have specialized cleaning solutions to clean just about any spot or stain including oil, grease, red or white wine, Kool-Aid, magic marker and even pet stains. Don’t fret over these common carpet stains of chocolate, punch, grease or wine carpet stains in Birmingham, AL, Heaven’s Best can clean them up, as well as brighten and freshen your entire carpet, rug or upholstery item. We also offer carpet and fabric protection, so these types of stains will be much easier to clean up in the future. Call Heaven’s Best today at (205) 618-9150.